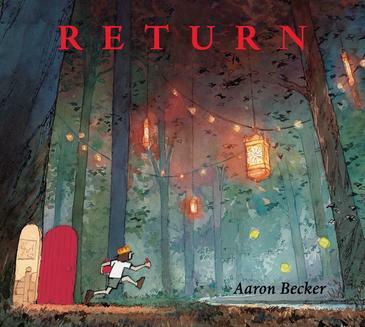 Return is the third book in the trilogy of wordless picture books by Aaron Becker that started with Journey (a Caldecott Honor Book in 2014), and which was followed by Quest. Dad is hard at work and having a hard time of it. He becomes distracted by a red kite which is a clue to his daughter's whereabouts. He follows her trail, passing through a red door to enter a forest beautifully lit by glowing lanterns. As he travels through a magical land, various red objects appear - a ball, boat, submarine. See if you can spot them and others. They spring from the girl's red crayon and imagination. The story is part fairy tale, part adventure as father, daughter and son encounter a king and soldiers, and escape on a flying horse. Like its predecessors, Return has a dreamlike quality to it. The illustrations are watercolours which drew inspiration from the artist living in Spain. Return, which was longlisted for the 2017 Kate Greenaway Medal, can stand alone as a story. However, I recommend collecting all three titles, which form a special trilogy that can be enjoyed by all ages, over and over. Visit Aaron Becker's website to see behind the scenes of his work, including a fantastic short video on the making of Return.